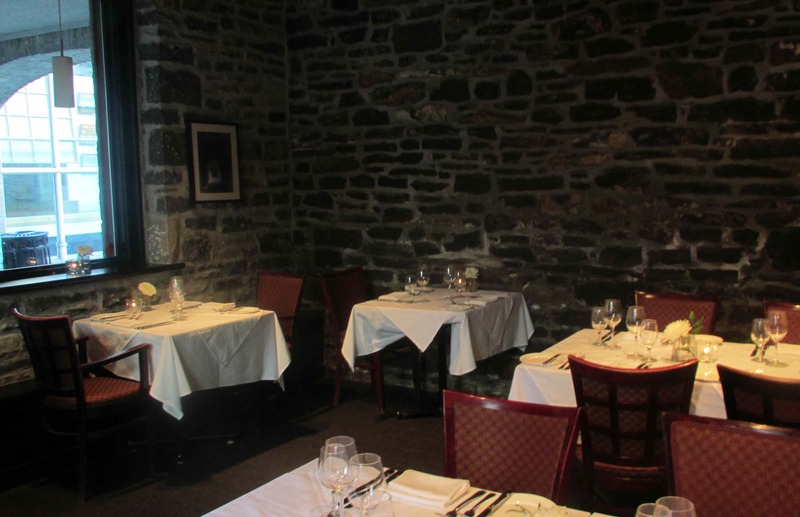 The restaurant has been operating for a little over thirty years but the lovely old stone building in which it is housed dates back to 1837 and has a colorful history, having served as both government offices and hotels at various times. Inside, diners can be seated on the upper or ground level and the plain stone walls give the place a certain understated elegance. 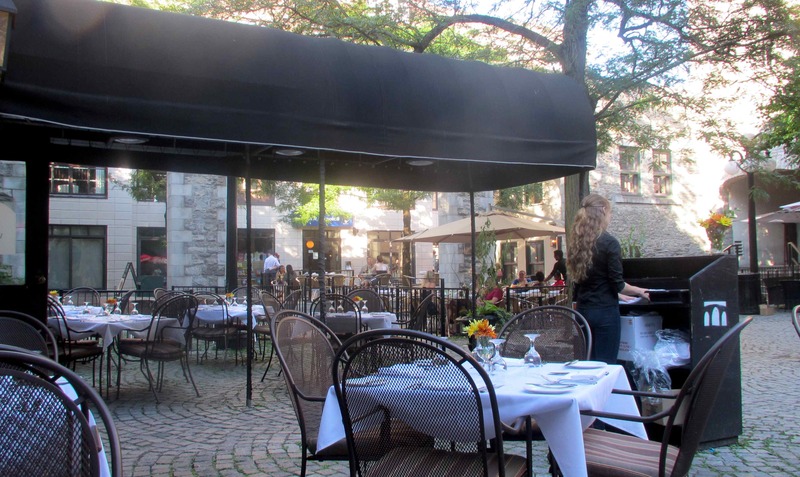 The patio seats about 50 and looks out onto the much larger courtyard area which serves as outdoor seating areas for 3 other restaurants. Here, you can see the view from my table. I was seated immediately when I arrived at 6pm and the young lady who greeted me was happy to dispense a little history. It took quite a few inquiries from my waiter to convince him that I really just wanted to sit and enjoy a drink before ordering but, other than that, the service was generally excellent. Scallop Appetizer – This was described as ‘Seared scallops with sous-vide pork belly, roast shallot and shallot gastrique, smoked cheddar grits, thyme gel, caramelized onion puree and scallions’. 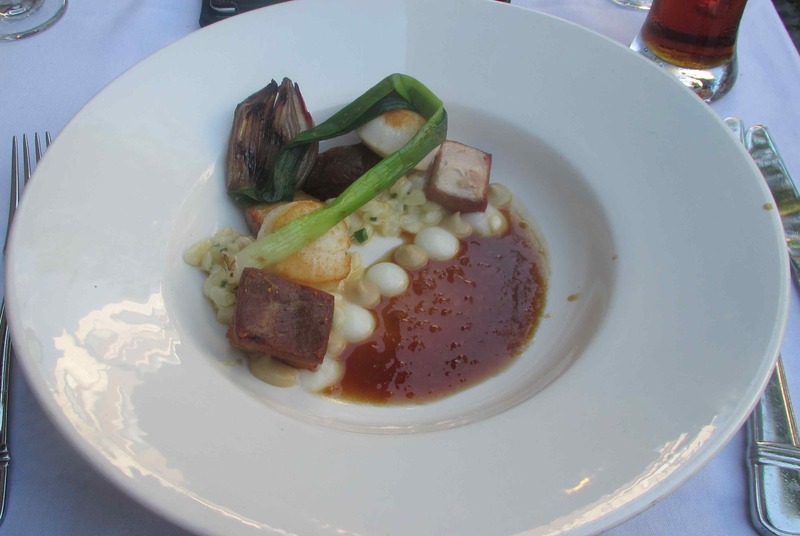 The actual dish, when it arrived, was very attractively plated and the aroma extremely enticing. The scallops were nicely seared but still exquisitely tender in the center and the pork belly was also tender but not to the point that it was falling apart. I wasn’t sure about well the cheese and grits (the whole grain hominy variety) would work but they actually complimented the other flavors nicely. I enjoyed this and gave it a 4 out of 5. 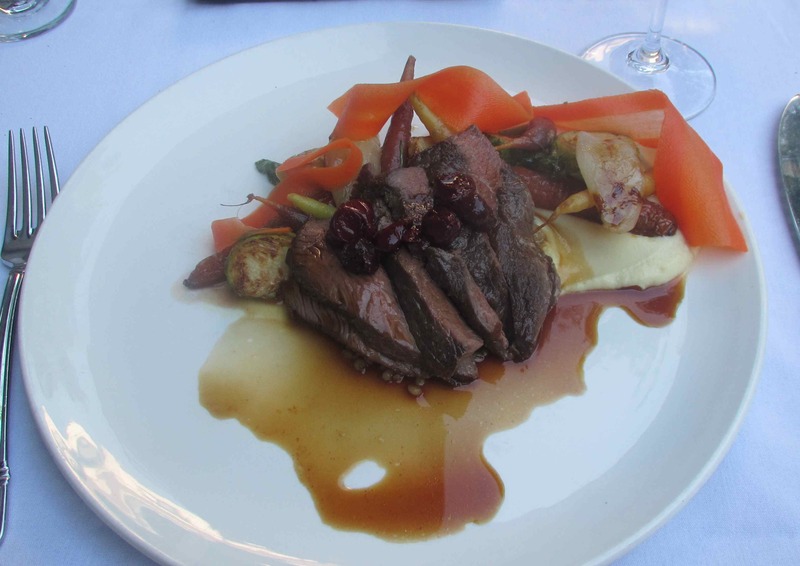 Elk – My main course was elk served with a parsnip puree, roast Brussels sprouts, salt baked onion, roast carrots, a wheat berry compote and sour cherry sauce. The menu suggested a Kingston Estate Shiraz as a pairing but I disliked the choice and chose an Ironstone Old Vine Zinfandel from California instead. I have to say that I liked this dish much less than my appetizer. It was my first experience with elk and I just wasn’t overly enamored of the flavor. The Brussels sprouts were also undercooked by a considerable margin, but, the carrots were beautifully roasted and the parsnip puree was absolutely perfect. I just hope to be able to reproduce the latter in my own kitchen sometime. In any event, while I really wasn’t wowed by this plate, I felt it deserved a 3 out of 5. 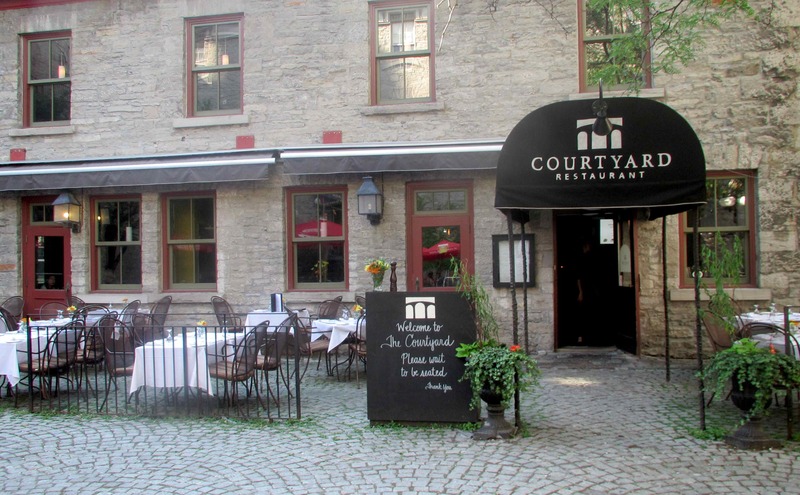 The Courtyard is a lovely restaurant with great service and it us obvious they take pains over the quality of food. Despite a couple of flaws in the meal I will be looking to come back here with my wife sometime. Rating 4 out of 5. It looks like a nice spot to dine. Isn’t it funny how a restaurant can excel on one dish and not execute another well. Quite probably I could have eaten there the following day and the quality of the two dishes might have been reversed.